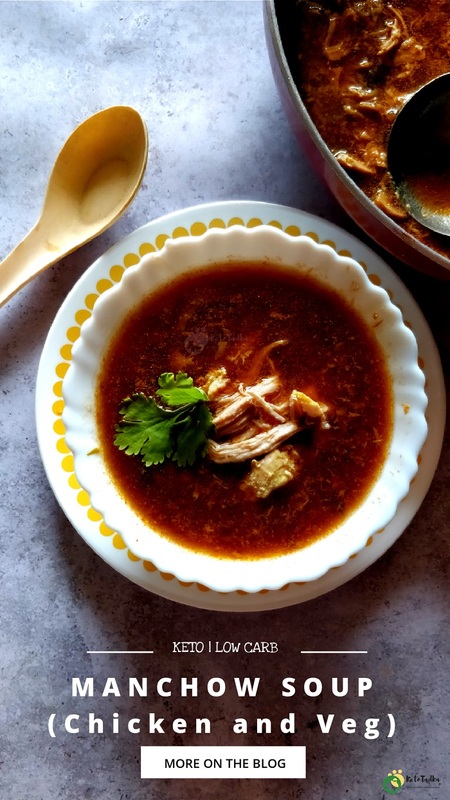 Keto Chicken Manchow soup for the win ! 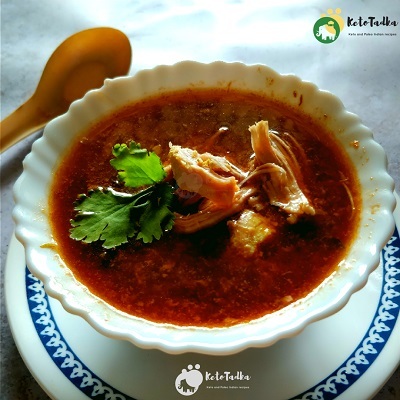 This Indo-Chineese burst of flavours in a single bowl , full of warmth; enough to make the heart of the Night King warm ! 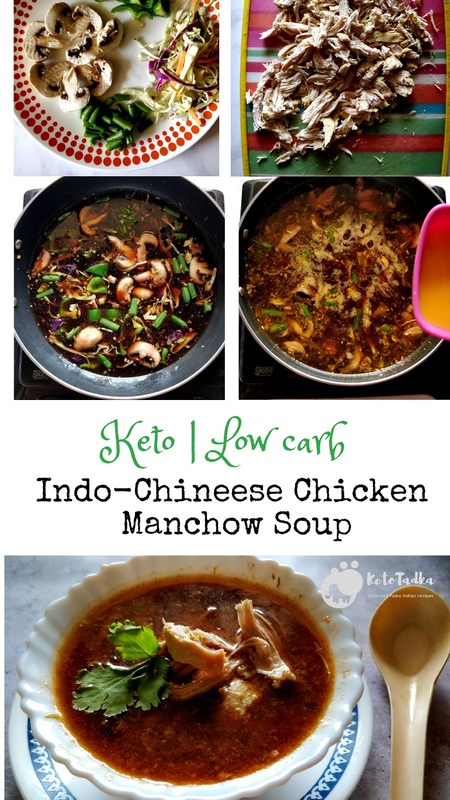 This Keto chicken manchow soup has a option to make it vegeterian too so that my vegeterian friends don’t frown ! The soup uses all the basic ingredients, right from your low-carb pantry and is ready in 30 minutes or less ! The recipe makes 4 servings of soup. If you want to store it, you can referigerate for 3 days. It thickens a lot as we are using xanthum gum for thickening, so microwave before use or add some water if you re-heating it; it will be good as new ! 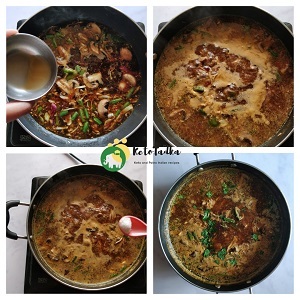 People making veg soup, have to use the xanthum gum slurry as we are not adding egg for thickening. Also, for making vegetable stock , boil the veggies in 500 ml water for 10 minutes and drain the veggies and use the remaining stock for the soup. Let’s get to the recipe ! 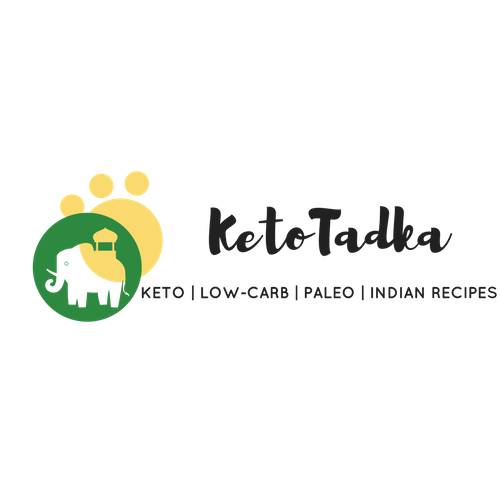 Not doing strict keto and doing moderate carb diet ? 500 ml vegetable stock reserve after boiling the veggies in it, add bay leaf and some pepper corns before boiling the veggies. 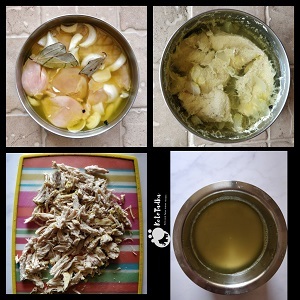 First, let's make the chicken stock and shredded chicken. Add 500 ml water and the chicken breasts. If you do not want a bland stock, add turmeric, salt (pinch of each), bay leaf and 2 pepper corns. Give 3 whistles in the cooker or cook on the stove top with a lid on for 25 minutes. Reserve the stock. Shred the chicken with a fork. 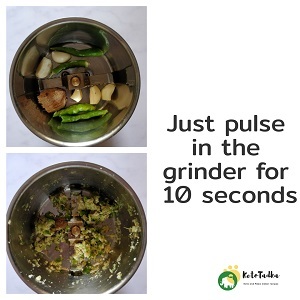 Take the ginger, garlic and chillies and pulse until it is coarsely ground. Do not add water and make a paste. Saute the ground ginger-garlic-chillies in hot pil along with the veggies. Cut the veggies more fine if you don't like blobs of veggies in your soup. Saute for a minute. Add the stock and boil for 5 minutes. 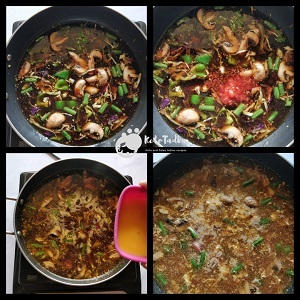 Add the coconut aminos (soy sauce) , red chilli sauce , tomato paste and mix well. Add half of the shredded chicken,combine well and boil for 3 minutes. Add water, and boil for a minute. Add the whisked egg, and stir immediately . Pour the egg slowly at a time. Add the xanthum gum slurry . 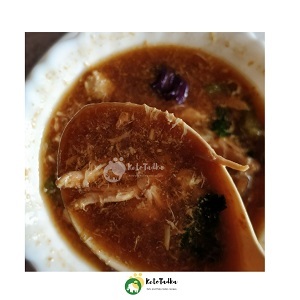 If you do not have it or do not want to buy it, egg is enough to thicken the soup. Boil for 2 minutes and garnish with coriander and the leftover boiled chicken. Make vegetable stock first. Take 500 ml water and boil the veggies in it FOR 10 minutes. Drain the veggies and reserve the stock . 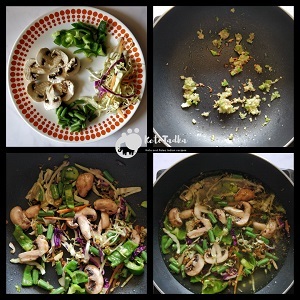 Add oil, sautee the ground ginger-garlic-chilly and boiled veggies. Add the water , boil for 2 minutes. Thicken the soup by adding the xanthum gum slurry. Do not skip the xanthum gum for veg soup or it will be runny. If you desire a runny soup, you can skip this step. Boil for sometimes until it reduces somewhat. Cool a bit and garnish with coriander.